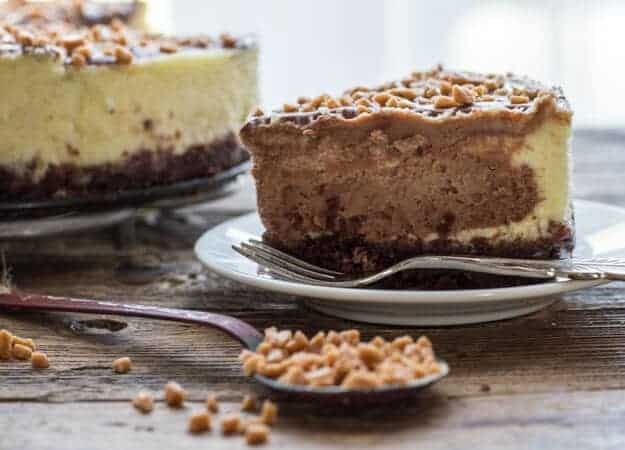 If you are looking for an Amazing Chocolate Cheesecake then this Skor Toffee Bits Vanilla Chocolate Cheesecake is the one for you. Rich and Decadent and oh so creamy! I have been a lover of Cheesecake from the first day I tried it at a Restaurant in York Ville. My friend and I decided to splurge and have dinner at one of the “In Places” in Toronto. Let me tell you after eating that cheesecake we splurged more than once! 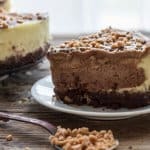 Since then I have made my share of cheesecakes, from a Baked Caramel Apple Cinnamon Cheesecake Tart, to a No Bake Summer Mixed Berry Cheesecake, to an amazing Seven Layer Brownie Cheesecake Parfait. But try as I might I could never get a Chocolate Cheesecake to work. The first time I was having friends over for dinner. All I can say is thank goodness I made more than one dessert! It was the worst Cheesecake I have ever tried and I ended up tossing it, it was so bad, nothing could save it. Now I can say after many tries and a few failures over the years, this Chocolate Cheesecake is a definite winner. And before I knew it I got the chance to make it again. A couple of weeks ago, one of my daughter’s friends was coming over for lunch and she asked if I would make her my Baked Macaroni and Double Cheese , and if at all possible Cheesecake for dessert. Of course, how could I refuse? 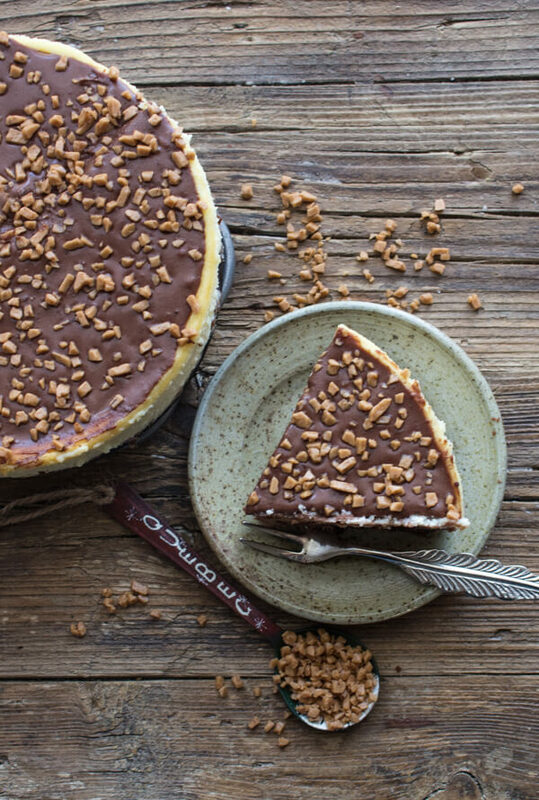 It was the perfect excuse to give this Skor Toffee Bits Vanilla Chocolate Cheesecake another taste test. And I knew I would find good use for the bag of Skor Chipits I bought in Canada. They are the perfect topping for this Creamy Chocolate Baked Dessert. I decided to go with a chocolate cookie wafer base. And the combination of greek yogurt and whole cream were the perfect balance. Since it was quite rich I decided it really didn’t need any kind of ganache. But why not a sprinkling of toffee bits? In fact it was a big hit. 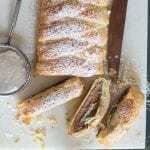 With Fall upon us, turning on the oven to bake something really Yummy is very comforting I think. Especially A Vanilla Chocolate Cheesecake. Enjoy! 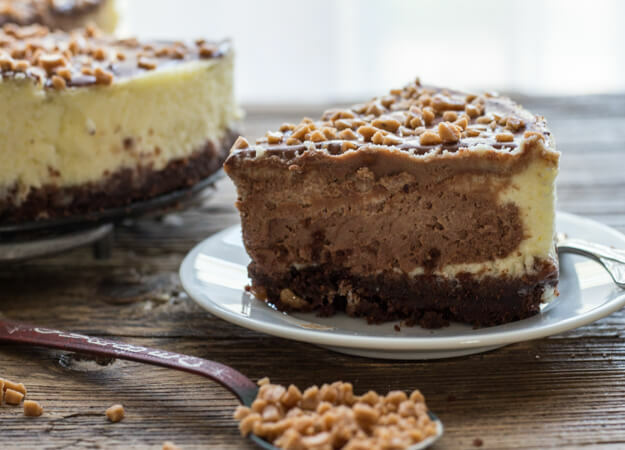 Vanilla and Dark Chocolate make this Homemade Vanilla Chocolate Cheesecake the Best Decadent Dessert.Perfect sprinkled with Skor Toffee Bits. Pre-heat oven to 350° (180° celsius). 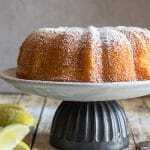 Lightly butter a 7-9 inch (17-20 centimeter) springform cake pan and wrap it tightly with foil (around the sides and bottom), this is to keep water out during the water bake. Mix chocolate wafer cookie crumbs and melted butter, press down on the bottom of the prepared cake pan. Bake for 5 minutes, set aside to cool. In a medium bowl on low speed beat the cream cheese, sugar and salt until creamy, beat in eggs one at a time, add vanilla, greek yogurt and cream. Remove half the mixture to a clean bowl and whisk in the cooled melted chocolate. 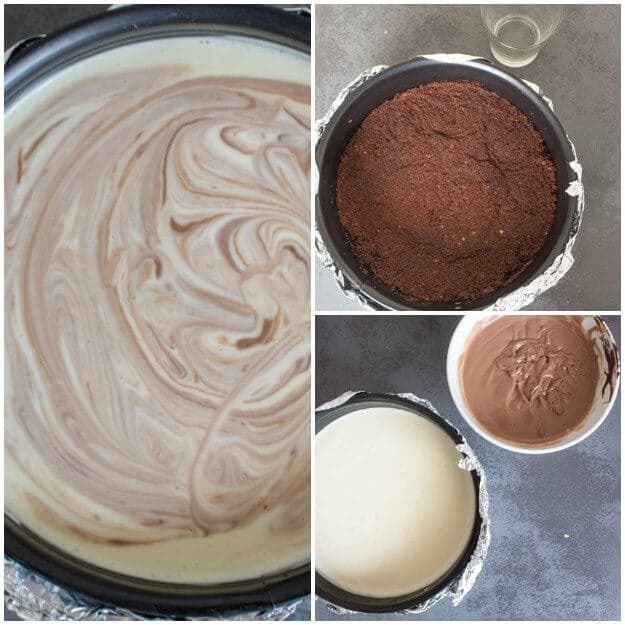 Pour the vanilla mixture on top of the cookie base (make sure the base and cake pan are not hot, you can touch it bare handed) and pour the chocolate mixture on top, swirl with the tip of a knife. Place cake pan (still wrapped in foil) in a big enough roasting pan and add enough water (careful not to get any water on the cake) to reach half the top of the cake pan. 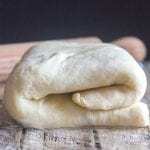 Place the pan carefully in the oven and bake for approximately 45-50 minutes. The cheesecake is done when the outside of the cake looks slightly puffed and set, the inside will jiggle (just like jell-o) when you gently shake the pan. Turn the oven off and leave the door open a crack, let the cake cool for an hour. Remove the cake from the water, remove the foil. Run a knife around the edges and let cool completely. 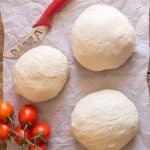 Refrigerate for at least 4-5 hours or even better over night. Top with toffee bits or mini chocolate chips before serving. Enjoy!